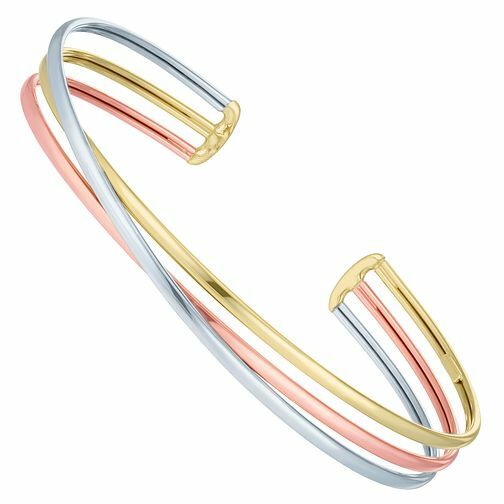 Designed with undeniable creative flair, this tempting twist bangle is styled in beautifully contrasting polished 9ct white yellow and rose gold. Perfect for effortless everyday contemporary chic. 9ct Yellow White & Rose Gold Open Bangle is rated 5.0 out of 5 by 1. Rated 5 out of 5 by Anonymous from Received my stunning bangle today, I'm over the moon with bangle, looks beautiful on. I'm over the moon with my stunning bangle, looks stunning on.